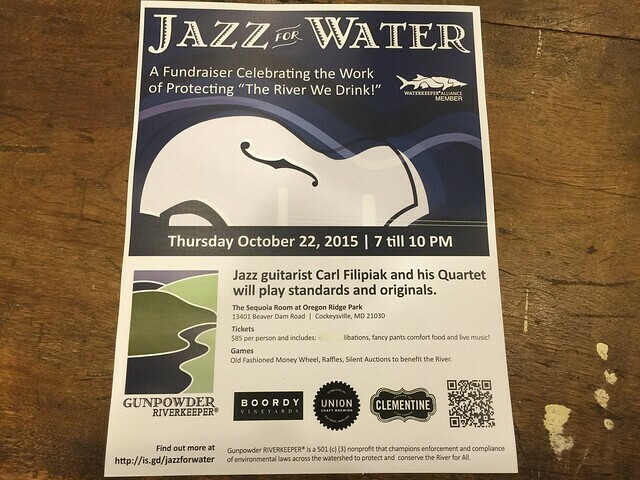 Join us for Jazz for Water. Tickets on Sale Now! It is centered on fun, music and food and supports the advocacy work of Gunpowder RIVERKEEPER® that protects the River, its small streams and wetlands and the communities that live, work and recreate along these waterways! Jazz guitarist Carl Filipiak and his Quartet will play standards and originals. Tickets and sponsorship opportunities available at Eventbrite. Locally Sourced Farm to Table Food and Signature Seasonal Cocktails by CLEMENTINE, Baltimore’s Home of Fancy Pants Comfort Food! Wine from Boordy Vineyards. Beer from Union Craft Brewing. Games: Old Fashioned Money Wheel, Raffles & Silent Auctions to benefit the River. Gunpowder RIVERKEEPER® is a 501 (c) (3) nonprofit that champions enforcement and compliance of environmental laws across the watershed to protect and conserve the River for All. This entry was posted in events on August 10, 2015 by Theaux Le Gardeur.